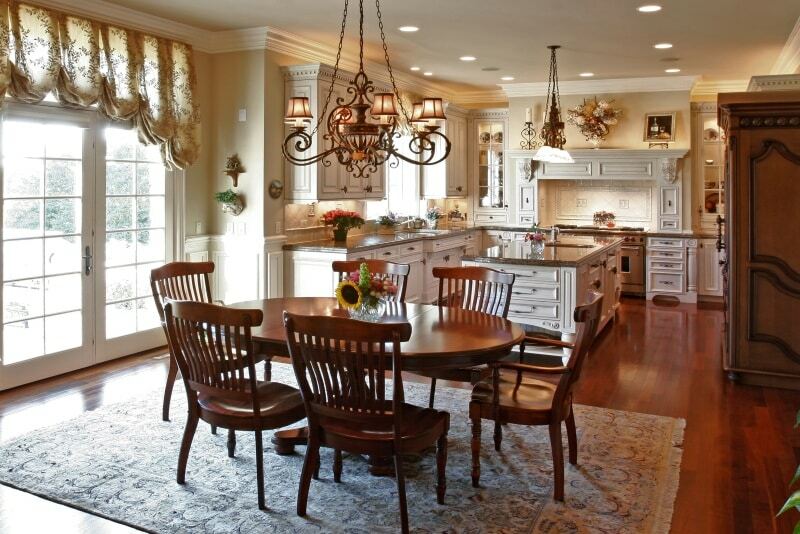 Bonjour and welcome to Art of the Home gallery of stunningly beautiful kitchens with hardwood floors! We hand-picked them for you…hope you enjoy the visit! Hardwood floors in a kitchen are simply gorgeous. As in all kitchens with hardwood floors, whether you have light hardwood floors, dark wood, golden brown or even painted hardwood floors, hardwood flooring is timeless and will add beauty and warmth regardless of style. 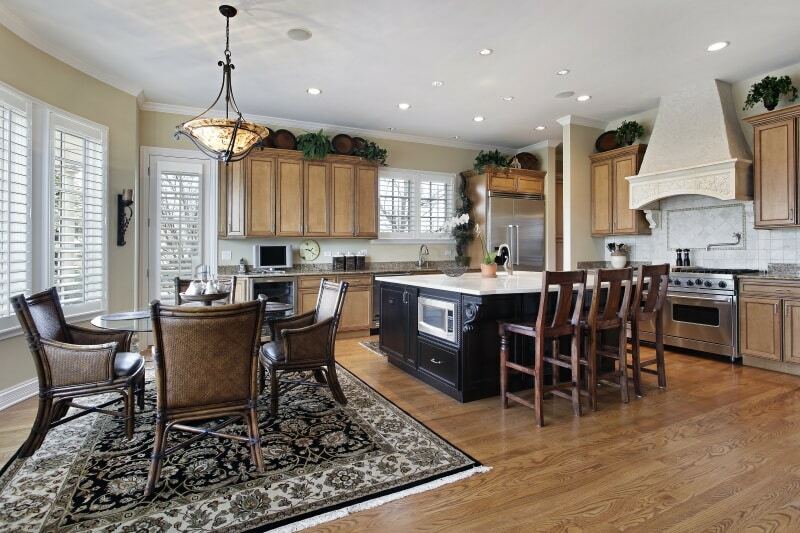 The key to maintaining kitchens with hardwood floors is to make sure your hardwood floors are properly sealed. You also should consider a type of wood that can sustain high traffic. So for example, pine (a relatively soft wood) may not be the optimal choice. A harder wood (e.g. maple, cherry, etc.) is a better alternative unless you like the look of rustic reclaimed wood planks…in this case, pine could work. 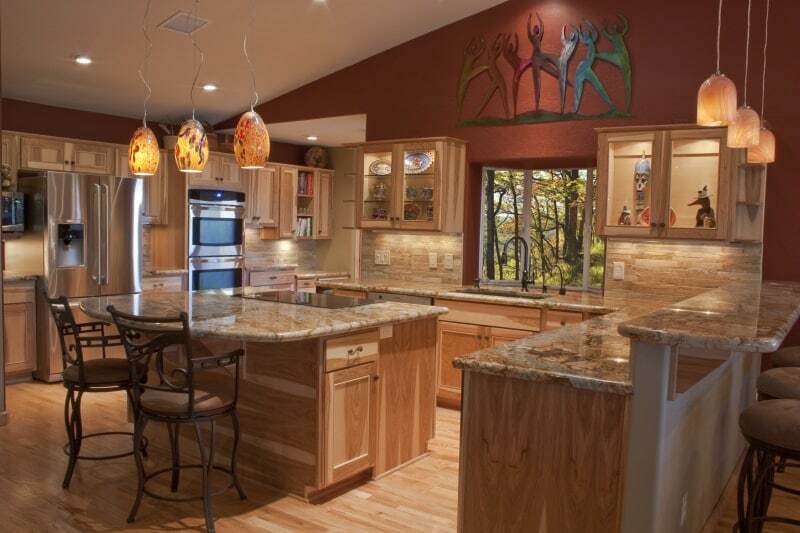 Now, when opting for kitchens with hardwood floors, just be ready to have hardwood floors that are lived-in. It would be unrealistic to expect for hardwood floors to remain flawless in an active kitchen. In fact, that’s the point, your hardwood floors share the stories of the precious moments you’ve lived over the years so they’ll have a few wisdom “wrinkles” to show for it — if you see what I mean. 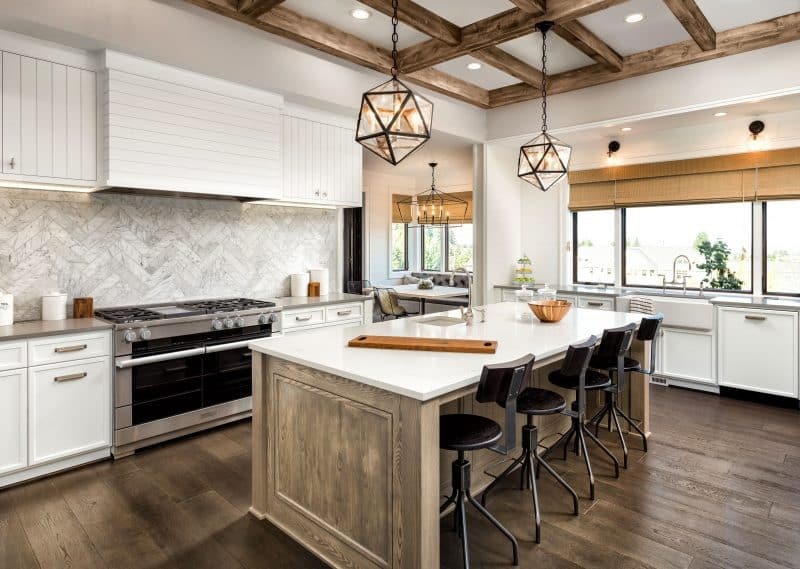 So if you are fully remodeling your kitchen, considering the addition of hardwood flooring in your existing kitchen or simply changing your hardwood floor finish, we hope you will find inspiration with the different styles and patterns showcased by the kitchens with hardwood floor pics below. Enjoy and beautiful day to you! The Little Plus: the matte hardwood floor with darker hues is a great complement to the glossy granite countertop and the two-toned cabinetry. 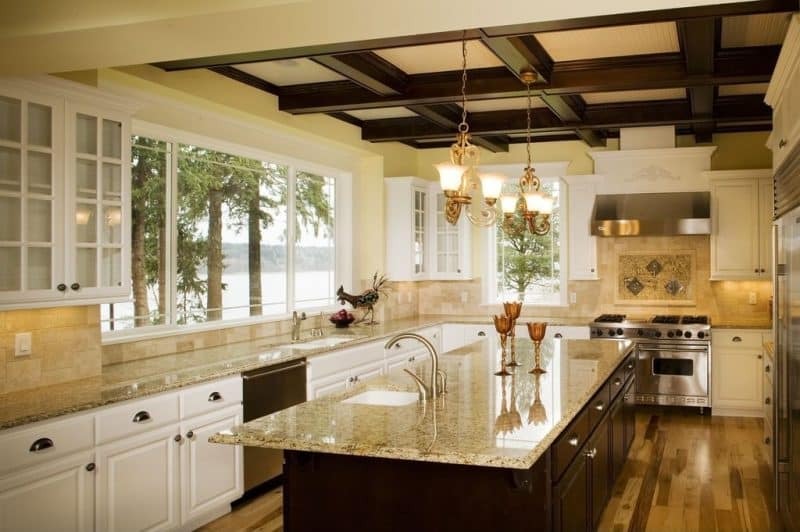 Also, notice how the coffered ceiling is tucked in — it adds an interesting design element without being overwhelming. And of course, that view is priceless…you would almost want to do the dishes all day! The Little Plus: adding a freestanding piece of furniture such as the armoire is a French country décor signature. It also offers a natural transition into the dining room. And notice the vibrant golden hues of the hardwood floor…gorgeous! The Little Plus: the satin finish of the maple hardwood flooring combined with the shiny chrome finish of the modern pendants goes perfectly with this all-white kitchen design. The Little Plus: the textured and engraved custom made range hood gives this kitchen a rustic country feel. Love the ceramic cross handle pot filler. The Little Plus: the low sheen hardwood floors…so very rustic. Stainless steel farmhouse sink. 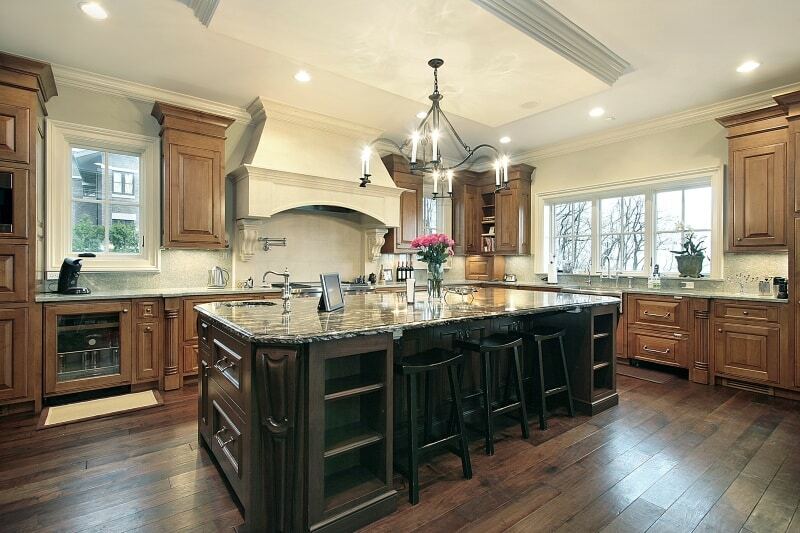 Large rectangular center island with tons of storage and where the stools neatly tuck in. The unique eight faux candle iron chandelier is simply beautiful! 6. Come Sail Away with Me…. The Little Plus: the stainless steel appliances and metallic charcoal gray cabinets. 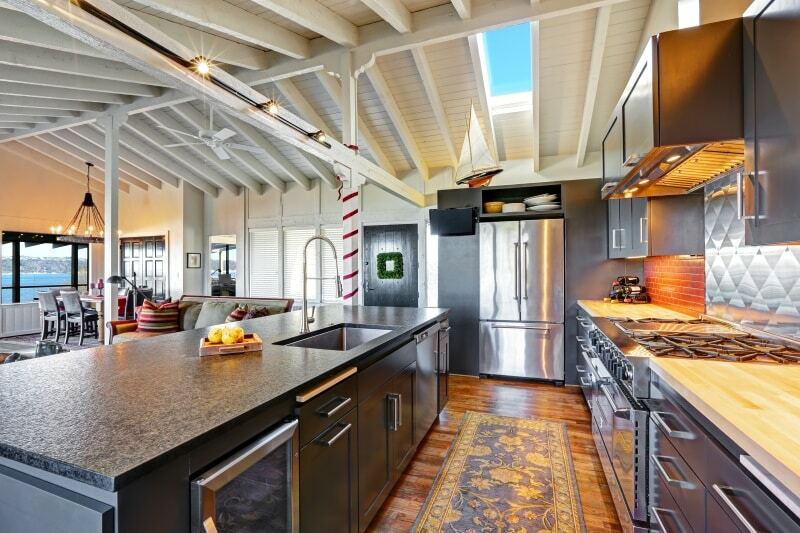 The reclaimed wood floors, glazed red brick backsplash, butcher countertop and the classic beach house vaulted ceiling all contribute to the “wow” factor of this gorgeous kitchen. And how about that ocean view…priceless! The Little Plus: the copper colored and textured vaulted accent wall spices up the lightness of the natural stained kitchen cabinets and hardwood floors. The pendant lights also add a splash of color.